Sure, I suppose you could consider this a Hanukkah dish. But I consider this an all-the-time dish that suits anyone from toddlers to dinner party guests. 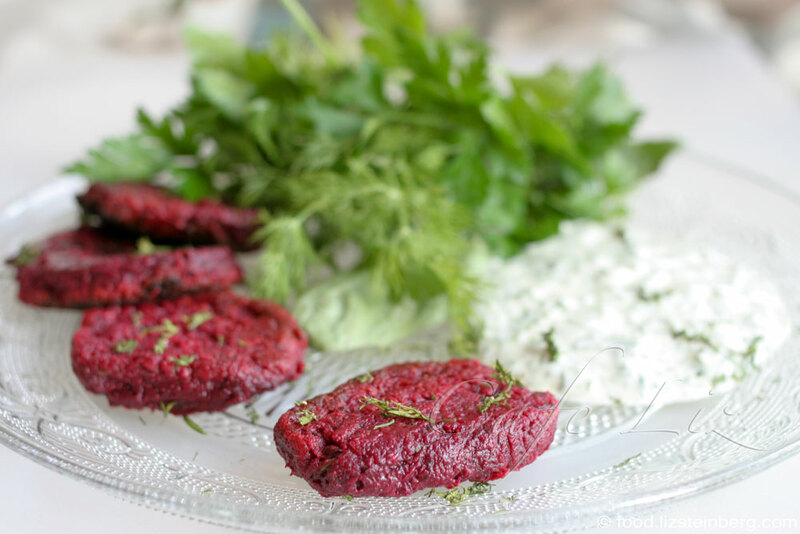 These beet patties had very humble roots in my kitchen: They started out as a way of repurposing old vegetable soup. I blended the soup, tossed in some flour and then fried the resulting batter into little patties in the style of Orna & Ella’s sweet potato pancakes. 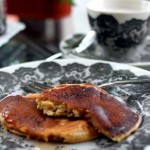 They were such a success — soft and sweet, and vibrantly colored — that next time around, I cooked vegetables specifically for these pancakes, without any pretense of treating them as soup first. 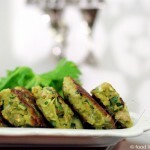 These pancakes contain no eggs, so the only thing holding them together is the flour and the frying process, which creates a delicate skin around the soft vegetable patty. They go well with a dipping sauce of yogurt and herbs, but it’s not a necessary component of this recipe. Wash the leek well and chop into thin discs — if you leave it in longer segments, the blender will not be able to handle the fibers and you’ll have stringy pancakes (trust me). Cube the beet and chop the garlic, and put the leek, beet, garlic and lentils into a pot with 1 cup water or broth. Cover and let cook. Once the liquid is nearly gone, test the beet to see if it is entirely soft — it should break easily when pressed with a spoon. If not, add another 1/2 cup of water, stir and let cook until the liquid is nearly gone again. Be careful not to let the liquid boil off entirely or the vegetables could burn. Add the flour and spices, and blend with a handheld blender until you have a paste. Heat a frying pan (I like cast iron) and add a thin layer of oil into the bottom of the pan. Lower the flame to medium. Spoon heaping tablespoons of batter into the pan, and flip with a spatula once the bottom of the pancakes are firm enough to withstand this (I like the precision offered by a metal spatula, but obviously you can’t use metal on a Teflon pot). Press down gently with the spatula on the pancakes, so that you have consistent, flat little disks. Remove to a paper towel once both sides have fried. Repeat with all the batter, adding extra oil to the pan as needed. Watch to make sure your pancakes aren’t burning or getting too dark, which can happen if the pan is too hot. Optional: Serve alongside a sauce of yogurt or mayonnaise with herbs — chop up handfuls of herbs such as parsley, dill, basil and chives and mix with yogurt and/or mayonnaise and some olive oil. 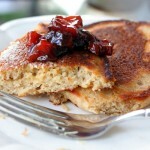 5 Responses to "Beet-leek mini pancakes"
Hi Liz! I keep reading your blog. Love the recipes! Have you tried eating or making something our of Amaranth? I have read about it but never tried. It is supposed to be really healthy. Hi Nina! No, I haven’t really used amaranth, I think maybe I bought it once years ago but that’s it. Are you coming to visit anytime soon? Hi Liz! We are actually coming for work in the beginning of Dec. Most of the time I will be covering the desert and Eilat but I will have an interview also in Tel Aviv. Would be nice to meet, may be with Jael too if she can make it!